Frodi walked out of the prairie against the woods to see a group of dissheveled, slovenly peasants in burlap rags dragging themselves along. He had to adjust his eyes, because he wasn't at first sure that he was seeing what his eyes told him he was seeing. These peasants were whipping themselves! The leader had a big flail and was whipping it upon his back with a vengeance, as if to set an example. They were moaning some kind of litany. "We are so sorry! We are so sorry! We are so bad, we are so bad. We beg for forgiveness. Please see fit to forgive us." Frodi stepped out into the middle of the road in front of them, his hands on his hips, his head cocked. "What are you doing?" "We are whipping ourselves," the leader said, as if all were obvious. "I can see that," Frodi said. "Why?" "Isn't it clear? We are sinners. We have sinned. We have displeased the Gods. We have displeased the Gods." Frodi smiled an ironic smile as he said, "I can quite assure you that you have most likely done nothing to displease the Gods. Who puts such thoughts into your heads?" "The priests," the leader said. "The Gods have sent the giants to punish us. If we will show our remorse, and punish ourselves, they will not punish us." "But you are doing their work for them," said Frodi, puzzled. "Friend, the Gods did not send the giants to punish you. The Gods did not send the giants at all. Something has gone horribly wrong, and you could be part of the solution, instead of whipping yourself." "What are you talking about?" said the leader angrily. "You speak madness." "I understand what I am saying sounds foreign to you. But the Gods don't want to punish you, nor do they want you to punish yourselves. The Gods, believe me, want you to be strong, and full of joy, with a sense of purpose, proud of your accomplishments, ready to celebrate them, and most of all, they want you to be free. "I know why you are whipping yourselves. This is no life to live. I get that. Your hearts tell you that a life that is not free does not make sense. Well, friends, where I come from, everyone is free, and no one has to live with giants. We drove them out long ago." The leader was displeased, but there were some gasps in the group. One fellow cried out, "Really?" Frodi smiled. "Yes, really. Think of the love you feel for your family, how close you feel to them, how much you want to spend time with them and do your best for them. The Gods want you to feel that feeling, and the Gods feel that kind of love for you. They don't want you to punish yourselves. They just want you to be your best, so you can shine, and be fruitful. But you can never truly be fruitful if you aren't free. Don't do the giants' work for them. Come with me. Come into the woods. I will teach you how to free yourselves, how to rediscover your smile and your laughter. I am building an army of joy that will drive out the giants for good." A few shuffled towards him, hearing the beacon of hope. The others scowled, and went off whipping themselves, including the leader, who looked quite angry at losing some of his men. "The sheriff shall hear about this!" he cried. "Go ahead," Frodi laughed. "You tell him that a man in green came out of the woods and offered to free your folk. See what he will say." As Frodi and his new converts moved into the woods, some nervously asked him if they were in danger. "Well," Frodi said, "in a certain sense you are in danger every day you're alive. That's what makes life exciting. But you're less in danger than you were before, because you weren't really living. Now you've begun a pathway which will make you feel, every day you manage to stay alive, more and more alive. But if you're worried about his threats about the sheriff, don't. We will soon be so far into the forest they will have no idea where we went. And I will show you others." "Many others. We have begun to form camps in the woods. We're beginning to steal back what the giants and their sheriffs have stolen from us all. We're sharing it amongst ourselves, and anything we have left, we share with those still in the villages. The giants rule mainly through fear, and keeping everyone separated. We are bringing people together, and slowly, we shall build an army that shall drive out the giants from here all the way to the farthest oceans and back. And then everyone will live in peace." "Is that possible?" one asked. "Come and see," Frodi said. "Come and see for yourself." He led them further into the winding woods, deep into the greenlands, where they began to smell the roasting of venison from a nearby camp. Their eyes opened wide. You decide : are you for tribal warriors or imperial soldiers? I'm not saying we don't have good soldiers, loyal and dutiful. That is not my point. Of course they are! Our imperial army is one of the finest. My point is, as a Germanic, what do I have to do with an imperial army? We've had many loyal soldiers. Show me the true tribal warrior these days. Has there been one since the Revolutionary War? Someone who will really fight for freedom? Someone willing to water the tree of liberty with their own blood in the pursuit of the blood of tyrants? I'm a wizard, not a warrior, but I would like to be shown some true tribal warriors. I've seen a few. Earth First!ers willing to put themselves on the line for the trees, Black Block Anarchists unflinching and without fear taking on stupid imperial riot cops, but such inspiring examples are few and far between. I'd like to see more warriors actually willing to challenge that which encroaches upon liberty. Some of those within the now largely-defunct militia movement who were not racists may fit this category as well. Some of them called themselves "patriots", and patriots they very well may have been. If anyone in America really understood and honored tribal warriors, they'd have a hell of a lot more sympathy for and solidarity with the Afghans, for example. Or almost all Arabs, who are just about as Germanic as you can get, if you strip away the Islam. Heathenism must be in tension with Islam by necessity, for Islam is anti-heathen, but Arabian culture, especially that of the Bedouins, is very similar in many ways to the ways of our ancestors : the raids, the poetry, the custom-law, the tribal chiefs. Throw in a few goddesses into the mix and you'd have something very close. No, I'm not advising some uncritical support for the "other side". But the "other side" suggests the limes, and when speaking of the Roman limes along the Rhine, I will ask : Which side of the limes are you on? Are you on the side of Imperialized Germany, or Free Germany? Do you support the brave soldiers who go to squash the rebellion of those barbarian tribal warriors? Or do those warriors remind you somewhat of your ancestors, and allow you to take a much more nuanced and complex position? I don't care whether this bluntness alienates anyone -- as anyone knows who has read this blog, I don't stop to care about that when there is a truth nagging at me to be told, nad I just trust people's ability to disagree if they have a problem. I'm not presenting so much here a position as I am a series of important and critical questions, which I understand people are going to take different positions around. But a good provocation, well-meant and intelligently presented, is often necessary to get people thinking in new ways. Intoxication is meant to be holy in our tradition, not desecrated. That is why Odin advises moderation in drink. Substances are meant to be teachers, not masters. They are powerful, and to be respected, not overdone --- which is very, very difficult in an alcoholic culture, and we live in an alcoholic culture. An alcoholic culture is the result of two things, mainly, as I diagnose it : a refusal to honor Tyr, and a refusal to honor Freyr (and note, significantly, how Tyr defends Freyr in Lokasenna). We don't fight the battles we need to fight to be truly free, and then not being truly free, we lack joy and put too much burden on substances to make us feel better. Overburdened and thralled --- no matter how high the paycheck, one can still be a well-paid thrall if the burdens are chains --- we lose the ability to have fun. Growing up in an en-thralled culture, a culture ruled by the giants, means that maturity is twisted into a denial of those abilities children spontaneously have --- play, joy, fun (Freyr qualities) --- and the culture compensates with chemicals. But placing that high of a burden on chemicals pushes the chemicals over into side effects and addictions, making the original situation worse by adding illness on top of it. 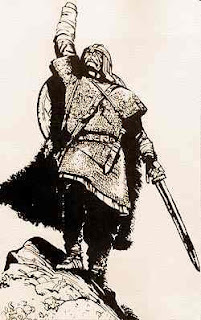 In short, behaviorally, in our deeds -- which matters most -- we dishonor Odin, who won us the mead but advises moderation ; we dishonor Tyr, who would have us fight our real fight against tyranny ; we dishonor Freyr by not pursuing his wisdom on how to access childlike states from a mature position. I don't want to insult anyone, but let's face facts and be truthful --- to have a mortgage is literally to be a thrall, a 30-year bondservant. It may be preferable to renting, no doubt, but it is not a state of full freedom as our ancestors saw it, nor does it approach allodial as our ancestors advised. We are burdened with tributes, taxes, and expenses that bind us far beyond our present capacities, and whatever the advantages of this clearly not-fully-satisfying option -- an option many choose for perception of a lack of better choices, it's also clear it makes being mature more of a burden than a fruition and fulfillment. What happened to the land in America which was supposed to have been restored from feudal status to full allodial rights after the Revolution? What have we, unjealous of Tyr's fierce warding of thew, allowed the lawyers and politicians to steal away from us in their gradual, obsfucating encroachments? And how has this robbery injured us? And do we fight back? 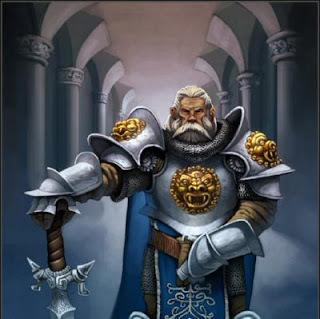 Do we do the duties of Tyr? Do we look down our noses at activists while cheering on Imperial soldiers who have invaded a sovereign nation in the Middle East because we citizens foolishly believe that is heeding the call of the warrior rather than fulfilling the manipulations of Rome? The soldiers who go may go with honorable and even heroic intent, and their duty in service of that intent ought to be honored, but how honorable is a citizenry that will not fight for its rights? The Gods have not allowed Jotunheim to encroach on Midgard ; we have. And worse, we often send our soldiers off to crush those who are -- unlike us -- trying to fight their battles. But rest assured, supporting such uncritical militarism will lead to a situation where those same soldiers will be used against us if we begin to fight our battles : labor history is full of such unfortunate realities built on the jotnar policies we ignorantly defend. Alcoholism is the classic sign and after-effect of colonized peoples. When fair fight and ability to meet challenge with right effort and will has been frustrated beyond remedy, when existence itself is clearly burdensome, what fun but through escape? But while fun is very much encouraged from our Gods, escape (unless as a strategic retreat, as per Germania 6) is cowardice that ill befits the call of the warrior. Do you think Tyr wants folks constantly on the battlefield? What insanity! He wants you to recognized the unmarked battlefield you're actually on, and to fight it there and fight it well. Where are you not standing up for yourself? Where are you running from a fight that could make a difference? Where the odds are too oppressive, how are you organizing to build your forces slowly and possibly secretly to be able to make a good engagement when the time comes Fight these battles, and the big wars will seldom have to come. Cowardice towards these battles means thralldom to legal, economic, and imperial burdens. The Gods want us to experience intoxication -- there is no doubt about that, and even for those of us not natural poets through the gifts of sacred substances -- but only as whole, full, strong, and free people standing proud on our own two feet, enjoying and not running, and therefore able to be moderate. O He who scrutinizes scratches in the beechwood. make magic with puffs of breath uttered poetically. and worship the highest heavenly father. This brag is a true one. It's true that life isn't fair, that rewards and outcomes are uneven, and things are not always reliable or consistent. These vagaries of fortune have always caused the most serious quandaries for the moral mind of mankind, and with good reason, for troubles vex us. Philosophers have pondered theodicy -- the so-called "problem of evil" for some time, but the matter of having someone to blame, whether it is God or the Devil, is a quintessentially human solution to a problem that cannot be fully solved. On the other hand, our Northern ancestors did not subscribe to this solution to the theodicy, because they never imagined that there were any entities that had ultimate control. There were some Big Guys (and Gals) who had a lot of power, power they had mainly won back through brave deeds from a sometimes hostile, often random universe, but there was no one who was "in charge" of everything that happened. No, not even the Norns, who are recorded as weaving and as recording and notating fate, but not controlling everything. If no one's in charge, there's no one ultimately to blame. Rather, our orientation, rather than being on blaming, is put back on DIY (Do It Yourself), and figuring out what you can do. After all, if the Gods won back some order and fortune from a chaotic universe through brave deeds, then that demonstrates that at least temporary victories are possible through the same means. It's true that there's plenty of jotnar to blame for all kinds of events, but they are simply expressions of a universe that, if not hostile, is more capricious than anything else, a universe that can have a decidedly Lokean flavor to it. This follows from the fact that the world was created from the remains of Ymir, whose name, according to page 727 of Cleasby/Vigfusson, means something like "Howler" or "Roarer". Ymr can also mean to "whine or cry", which renders the synthetic meaning of "Screamer", the image of a randomness so complete it was like a howling blizzard. Out of this monstrous chaos where nothing was ordered, the Gods created a world, a good world, but a world still ruled by the vagaries of fortune, of wyrd. If there's no one to blame, then we need to focus our attention on actions and attitudes which will render victory from the entropy and create an ordering-possibility, which might be an interesting new way of defining heill, which does not so much guarantee success as it provides for its possibility. Success (ie, sig, victory), on the other hand, boldly won, in however small a way, does render heill, because anentropic goodness has been freed from the grip of entropic forces. Life is a gamble. It always has been, and it has been even for those immensely powerful and benevolent beings we call Gods, but they show us how to face life's gamble with courage, determination, strength, audacity, and bravado. There is an element of defiance that the Gods admire, and so, it would seem, does Wyrd as well. Audacity is a noble stance in the face of a sometimes fickle distribution of fortune, and fortune, it seems, often smiles upon the bold. We get no guarantees by being bold, and indeed will often slip over the edge into foolhardiness, many times courting failure by daring to take risks, but we will win more, and more quickly, than those who always play it safe, and, additionally, even when we fail, we will fail nobly, in a stance that does not cower in submission to a dangerous universe, but stands up tall and proud even when one is terrified inside, and rely on the strength of the Gods' megin, and face fate, though trembling inside, with courage that refuses to bow down. Who do I blame? We all understand the impulse. And it would be untrue to say that element didn't exist in our tradition, because we're all, after all, human, and it's quite human to want to blame. Despite attempts to blame it all on the Christians, demonology (we can call them jotnar or trolls, but they were demons all the same) was just as rampant in our culture as it was in any other folk culture, and the Gods indeed were seen as vanquishers of demons. But it was placed in a heroic mode such that even with demons, the goal was to boldly take back what had been taken away, so that another piece of wholeness could become possible in the world. Then we also have the records of bitter warriors who blame Odin for not giving them the victory, again, as if he had complete and total control over everything. But our Gods are Allies who have great power, not puppet masters. Thank the Gods for that! Heathenism is a philosophy of difference, which is to say not only do things matter, but our decisions can make a difference in this world. Many philosophies are philosophies of indifference that posit that the universe is completely indifferent to our decisions, and moreover, that we should cultivate indifference to what happens in this world, becoming completely passive and acquiescing "to the way things happen". That's a thrall's mindstate in heathenism. A heathen has far more faith and gumption to "acquiesce" to anything. A heathen believes in the power of daring, and believes in Gods who admire audacity, and in fact, so long as it stays somewhat in balance and governed by other important values, they cultivate it in their followers. From a heathen standpoint, the universe is something to be struggled with, and moreover, that struggle is literally creative, because it creates new opportunities, and pulls out potentials that would have remained dormant without struggle. We are not required to "accept" or "acquiesce" to anything, and everything is up for some kind of creative challenge. That is how we grow and learn new things. We are people who boast. If we didn't boast, we'd never get the chance to brag, and we like to brag, because it gives us a sense of satisfaction to have secured something from the world that was once believed to be impossible. Our mythic history tells us without such gumption, wit, daring, and even willingness to use tricks, the universe would be a less abundant place. What is the point of doing good deeds and living with honor if it makes no difference whatsoever? To be a good little slave? What kind of philosophy is it that wants adherents to be conformists to the status quo? Odin is an eternal enemy of status quo*, because it is not what some petty mind has established as "as is" that truly matters or is lasting, but the flows and undulations of Wyrd itself, which is more powerful than anything, before whom entire empires fall. You may say, well, surely, we must acquiesce to Wyrd. No. Even Wyrd itself is to be challenged. That is what daring and boldness are all about. The only way to discover the nature of anything is to be constantly testing its limits, and in the process, to be surprised to discover that its nature in fact surpasses our limited concepts of it. Some might call that "science". I'd simply call it the cultivated audacity of a free people. Through our boasts and deeds of daring, we discover the true extent and creative depths of Wyrd. Wyrd is deep, and vast, and contains more than enough lots for there to be room for every endeavor. Wyrd is bountiful and precise, exacting and forgiving, elastic and full of domains finite but broad and full of potential. 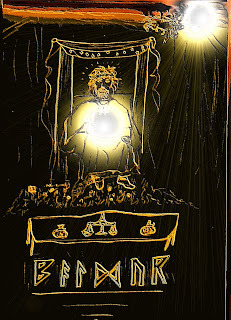 More importantly, Wyrd is always renewing itself, recycling itself, in new combinations that open up new opportunities. There is room for our daring. And it can make a difference. If we're lucky. That chance is what makes the entire endeavor worthwhile. * You may say, but Odin was a patron of kings! Ah, yes, but keeping in mind what I have said about Odin as an enemy of "status quo" as such, you now have a unique insight on the profoundly different nature of true Teutonic kingship to ponder. 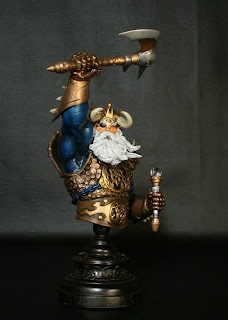 Plug it in and see what happens : If Odin is an eternal enemy of status quo, and Odin is a patron of kings, then the nature of Teutonic kingship is ... Try it on and see what happens! Kings too must be audacious and bold.